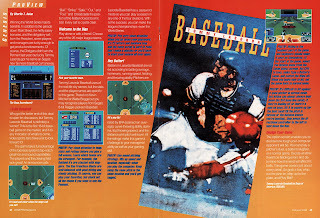 The 2017 Major League Baseball season begins today so I scanned a handful of baseball game reviews from the earliest issues of magazines I have which is why many of these scans are from 1989-90. 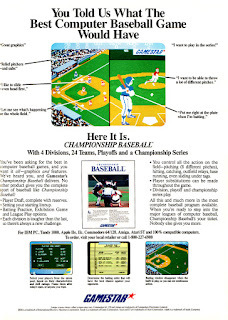 In the '80s sports games rarely had official licenses, full seasons, or statistics tracking, instead they often featured generic athletes and minimal play modes. Sports video games, and baseball in particular, really took off in the 16-bit era and continued to be strong on the 32-bit consoles, in no small part to Electronic Arts' EA Sports brand. 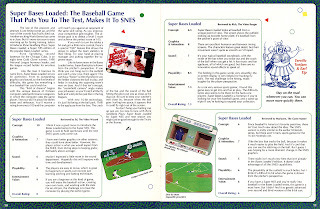 Along with EA (Tony La Russa, MLBPA, Triple Play), Sega had Sports Talk Baseball before World Series Baseball, Acclaim published Frank Thomas Big Hurt Baseball and then All-Star Baseball, Konami developed Bottom of the 9th, Interplay released VR Baseball, The 3DO Company started High Heat Baseball, Crystal Dynamics made an attempt with 3D Baseball, Sony made MLB, Nintendo had a couple Ken Griffey Jr. games, and series that continued from the '80s included Hardball! 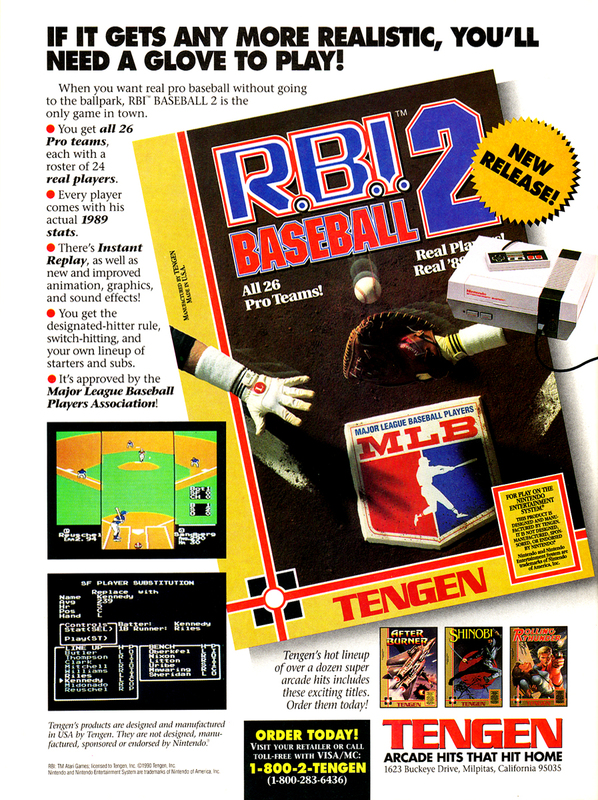 (Accolade), Bases Loaded (Jaleco), and R.B.I. Baseball (Namco/Atari). First up are three reviews from Electronic Gaming Monthly (EGM) written by Steve Harris, Ed Semrad, Donn Nauert, and Jim Allee. Reggie Jackson Baseball is for the Sega Master System which the magazine doesn't actually mention. 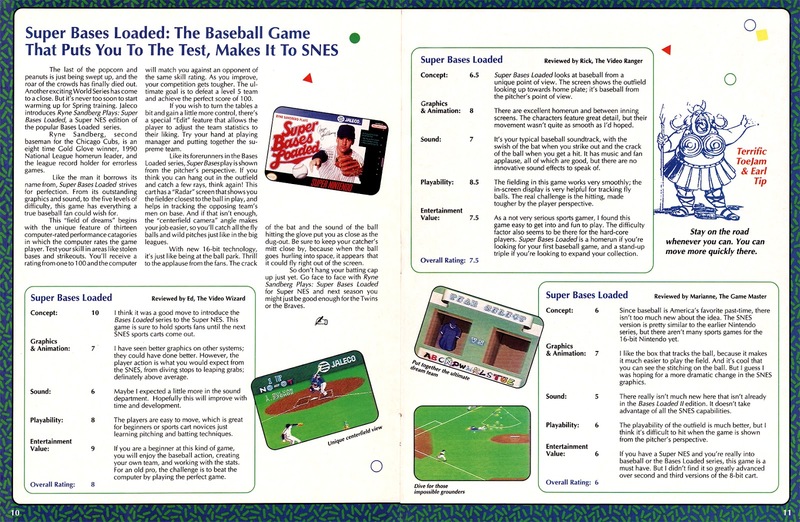 The second game, Baseball for the Game Boy, has appearances by Mario and Luigi as pitchers. Lastly is the Genesis launch title Tommy Lasorda Baseball. I played a lot of sports video games when I was younger and I do still own all three of these. I agree with most of their scores, though Reggie Jackson Baseball and Baseball for Game Boy are probably closer to a six. Next is a review for Tommy Lasorda baseball from GamePro before they implemented their ratings scoring system. The "proview" for Bases Loaded reads more like a preview though their reviews were part of this section before the magazine added their ratings. 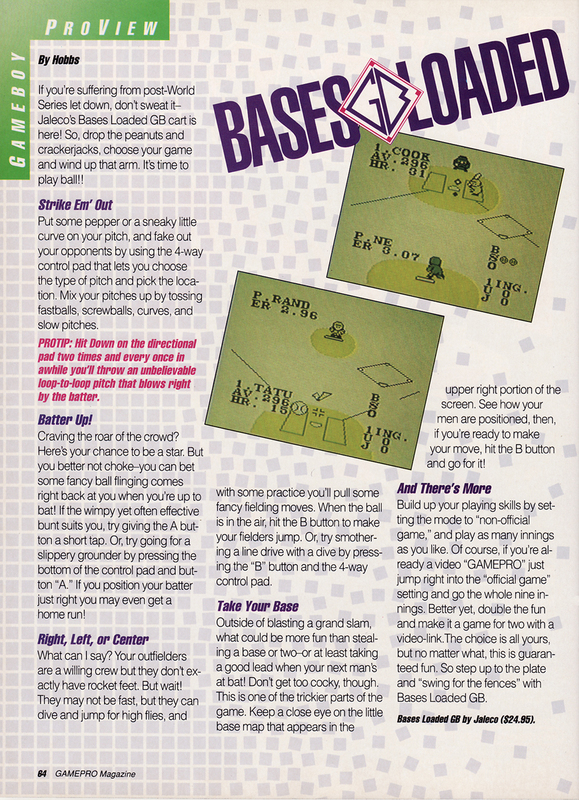 I do own Bases Loaded as well; it's a solid game and better than the basic Baseball reviewed by EGM above. 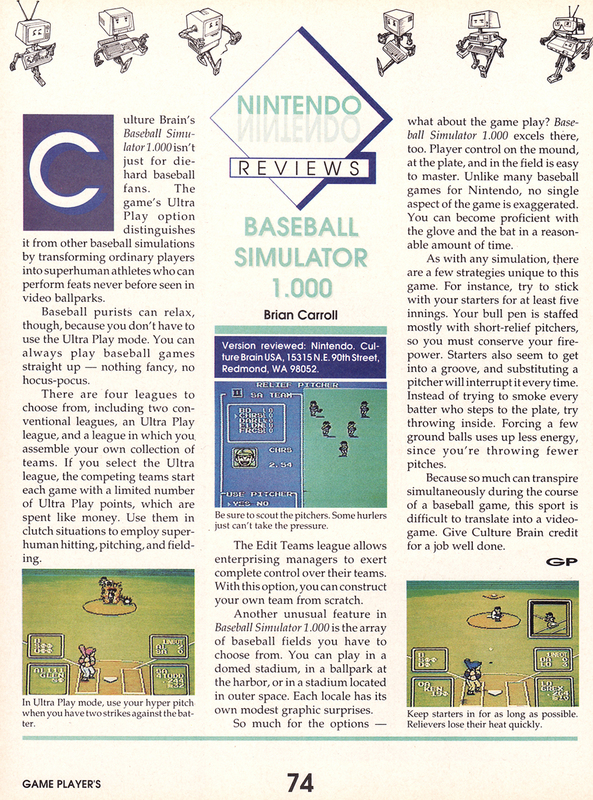 From Game Player's magazine is a review of Baseball Simulator 1.000 for the Nintendo Entertainment System. I've never played this one though I've heard good things about it. Although it can be played by standard rules, it's popularity comes from the mode with power-ups. 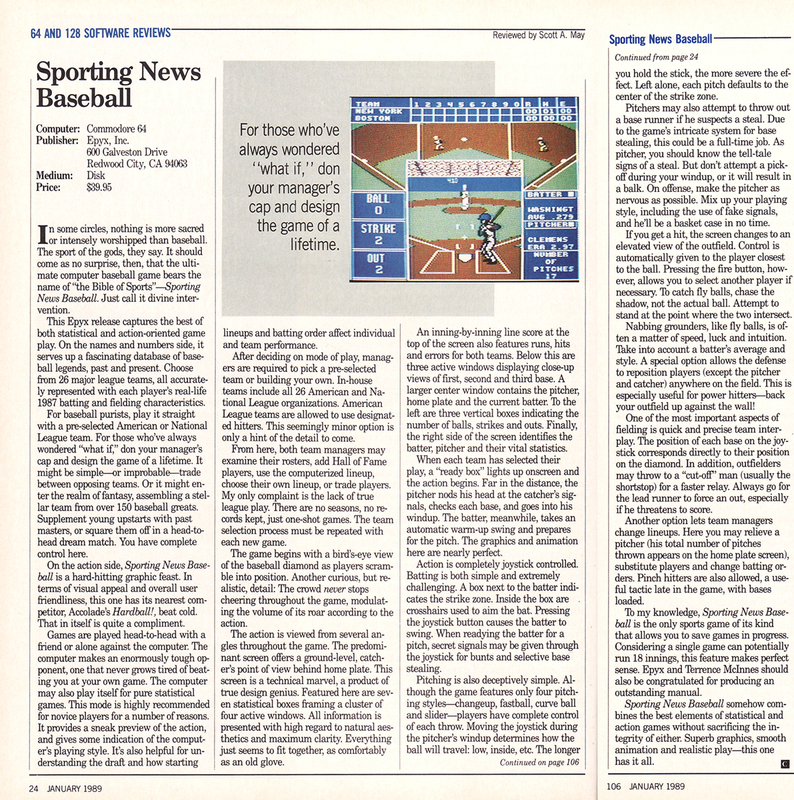 After that is a review from Game Informer for Super Bases Loaded. The ToeJam & Earl tip next to the review does look out of place but this particular Game Informer issue has ToeJam & Earls tips located throughout it. 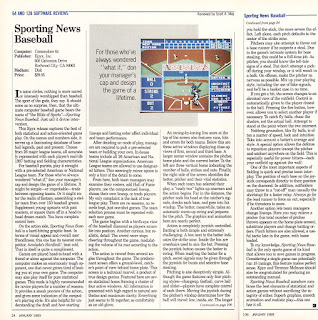 Last up is a review of The Sporting News Baseball from Commodore Magazine. This is yet another baseball game I own that I enjoyed quite a bit in my youth. It only has exhibition games but it does have the MLBPA license for real players, including baseball greats, and the ability to create a team. If you're unfamiliar with The Sporting News name, it was a newspaper and later a magazine that dates all the way back to 1886. Like many other print publications, it has since become an online only news source. 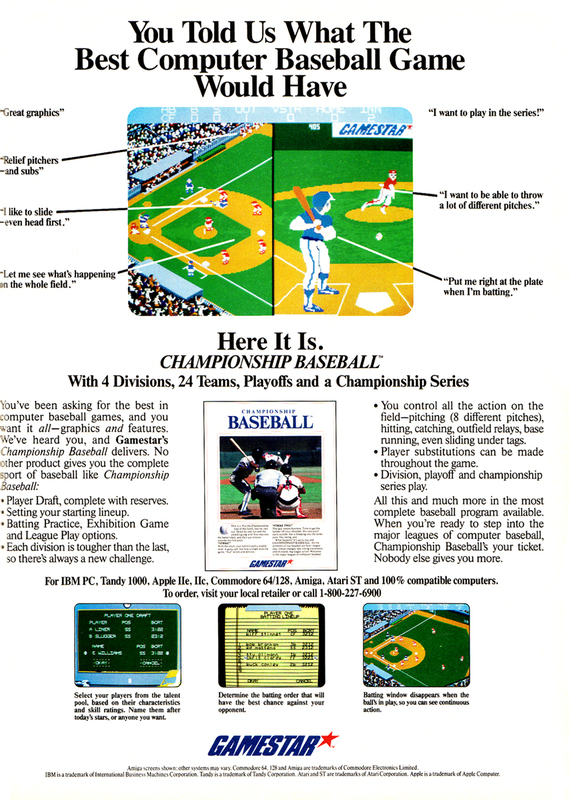 Unfortunately, there are not many baseball video game options today, especially those with the MLB license. If you want to play an in-depth, officially licensed baseball game where you control the action then Sony's MLB: The Show 17 for the PlayStation 4 is really the only choice. MLB brought the R.B.I. series back to life a few years ago but those games have been very basic and not too good. PC players can try their hand at managing a team in Out of the Park Baseball 18 but you can't control the players as it's purely a simulation. That developer, Out of the Park Developments, also released a mobile version this year titled MLB Manager 17. If you just want to play baseball and don't care about using MLB teams and players, Nintendo's newly released 3DS game Mario Sports Superstars has a baseball mode in it. There is also a Super Mega Baseball sequel planned for later this year.